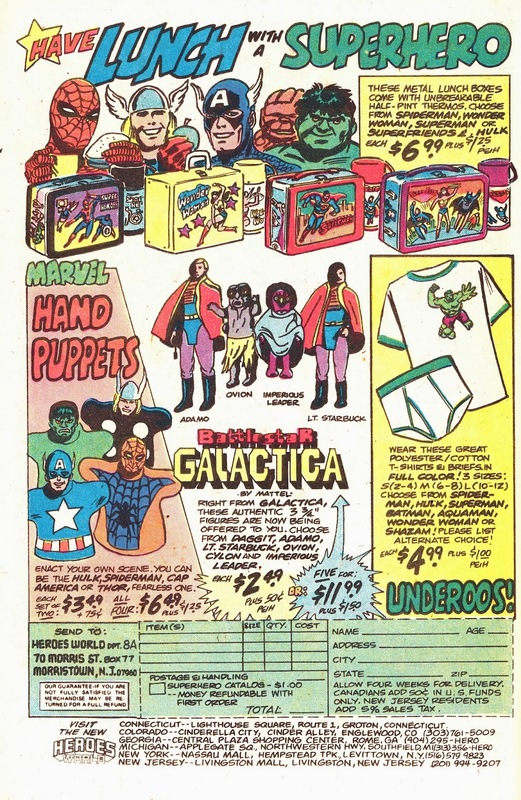 Is that a Hulk in your Underoos… or just a hand puppet? More late-seventies licensed bits-and-bobs courtesy of the folks at Heroes World. The artwork here is - ahem - interesting. The BATTLESTAR GALACTICA figures, which never looked much like their screen counterparts, are rendered even more rubbish here (and don't mention the colour scheme… I guess the designer deemed Colonial brown too dull for an eye-catching ad) and there's something rather cute about a fat-faced Hulk who looks like he's stuffed his cheeks for a game of Fluffy Bunny. This appeared in MARVEL US books in 1979.